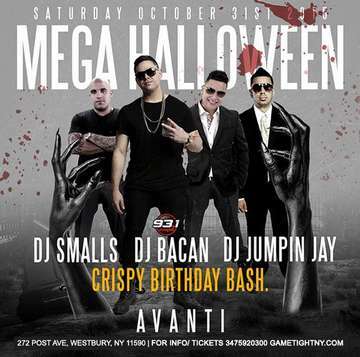 AVANTI LOUNGE HALLOWEEN PARTY – WESTBURY LONG ISLAND NYC - HOTTEST HALLOWEEN LONG ISLAND PARTY NYC WITH THE HOTTEST COSTUMES! 1000 PEOPLE EXPECTED - FULL CAPACITY! MUSIC BY NYC HOTTEST RADIO DJS MEGA 97.9 DJ SMALLS, AMOR 93.1 DJ BACAN, DJ JUMPIN JAY & MORE AT AVANTI CLUB NYC IN WESTBURY LONG ISLAND! HALLOWEEN IN LONG ISLAND NY PARTY ! TICKET EVENT 18 FOR LADIES / 21 FOR GUYS! HALLOWEEN PARTY @CLUB AVANTI IN WESTBURY LONG ISLAND NEW YORK CITY, NY! CAPACITY EXPECTED! BUY YOUR TICKETS NOW FOR JUST 20$! EARLY BIRD SPECIAL! Avanti Club NYC Halloween Dress Code: Its Halloween – be creative! Avanti Westbury NYC Halloween Music Type: Best of Hip-Hop, Reggae, Latin, House, Dance, Top 40 & more! Avanti Long Island NYC Halloween Bottle Packages: Bottle Prices available by request. RECAP OF LAST YEAR AT CLUB AVANTI HALLOWEEN!